If you live in Oklahoma, the drug you’re most likely to be prescribed is the opioid painkiller Vicodin -- or some other combination of hydrocodone and acetaminophen. In Texas, the #1 drug is Synthroid (levothyroxine) – which is used to treat thyroid deficiencies. In California, its Lipitor (atorvastatin) – a statin used to treat high cholesterol. And Tennessee has the unique distinction of being the only state in the country where the addiction treatment drug Suboxone (buprenorphine/naloxone) is the most prescribed drug. 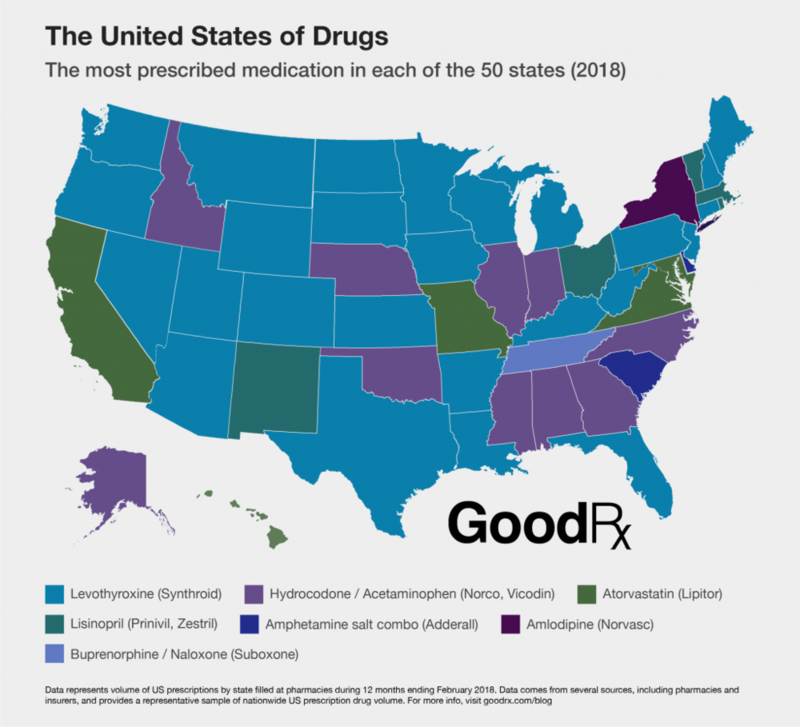 These findings are part of an interesting study by GoodRx, an online discount drug company, on prescribing trends in all 50 states. GoodRx looked at pharmacy and insurance data from around the country – not just its own customers -- from March 2017 to February 2018. It then developed a map to show how prescription trends can vary by region and by state. Levothyroxine (Synthroid) is easily the top selling drug in the country. It’s #1 in 26 states (AR, AZ, CO, CT, FL, IA, KS, KY, LA, ME, MI, MN, MT, ND, NJ, NV, OR, PA, SD, TX, UT, VT, WA, WI, WV, WY). Hydrocodone (Vicodin, Norco, Lortab) is #1 in 10 states (AK, AL, GA, ID, IL, IN, MS, NC, NE, OK), mainly in the South and Midwest. As recently as 2012, hydrocodone was the most widely prescribed medication in the country. Since then, hydrocodone prescriptions have fallen by over a third and it now ranks 4th nationwide. Atorvastatin (Lipitor) is #1 in 5 states (CA, HI, MD, MO, VA) and so is lisinopril (MA, NH, NM, OH, RI), a medication used to treat high blood pressure. There are a few outliers. New York, for example, is the only state that’s #1 in amlodipine (Norvasc), a blood pressure medication, and Delaware and South Carolina are the only states where the leading prescription drug is Adderall, a medication used to treat Attention Deficit Hyperactivity Disorder (ADHD). That brings us to Tennessee, one of the states hardest hit by the opioid crisis. In 2012, doctors wrote 1.4 opioid prescriptions for every citizen in Tennessee, the second highest rate in the country. The state then moved aggressively to shutdown pill mills and expand access to addiction treatment -- which explains why Tennessee is #1 for Suboxone. Prescriptions for opioid pain medication have dropped by 12% in Tennessee since their peak, but overdose deaths and opioid-related hospitalizations continue to climb, due largely to heroin and illicit fentanyl. No other state even comes close to Tennessee in per capita prescriptions for Suboxone. Addiction treatment has become such a growth industry that Tennessee has adopted measures to rein in the overprescribing of Suboxone.